Item # 309985 Stash Points: 1,799 (?) This is the number of points you get in The Zumiez Stash for purchasing this item. Stash points are redeemable for exclusive rewards only available to Zumiez Stash members. To redeem your points check out the rewards catalog on thestash.zumiez.com. Keep your pants fastened with trippy style in the Primitive Dirty P Black Web Belt. 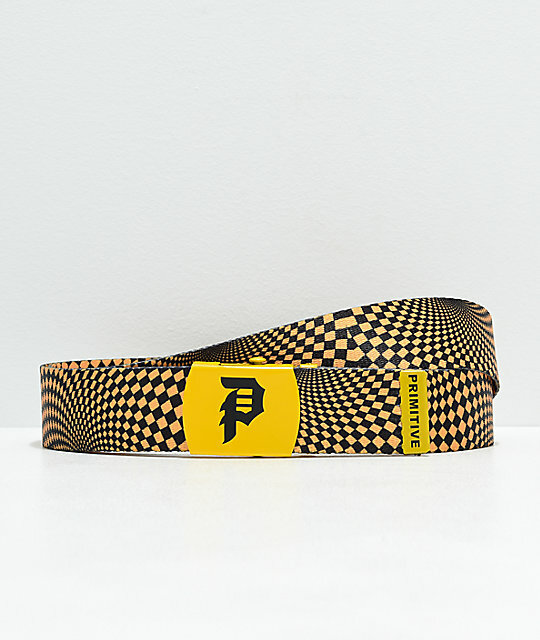 This black and yellow checkered belt has an anti-fray metal tip for durability and features a large Primitive P logo at the buckle for additional flair. Dirty P Black Web Belt from Primitive. Buckle Dimensions: 2.25" x 1.75 | 6cm x 4.5cm.